What we don’t want here is a failure to communicate. Especially with our students. There is no one-size-fits-all method to convey information we deem important to students. It varies from campus to campus, from class to class, from generation to generation. I think we can all agree experimenting with various methods is the most effective means. I recently wrapped up a study in which my research partner and I looked at how students found items in the stacks once they had a call number. We found that the more opportunities we provide along the way to communicate information to students, the better. With that in mind, here are a few ways to communicate with students. 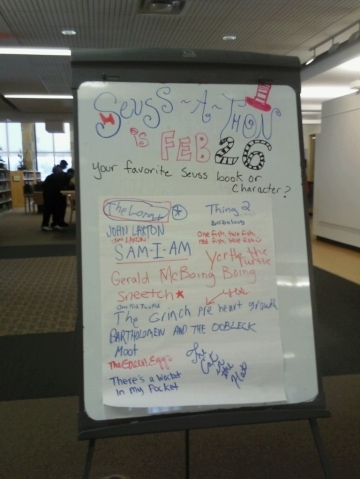 Collecting and sharing information, or handwriting is not dead! We provide free printing in our library (yeah, don’t all come running to use our printers, please!) This often leads to hundreds of copies of the same PowerPoint printed off because 50 other students are all printing papers right before class and PowerPoint printer thinks that their work isn’t getting printed. Students get mad, desk staff are frustrated and all heck breaks loose. 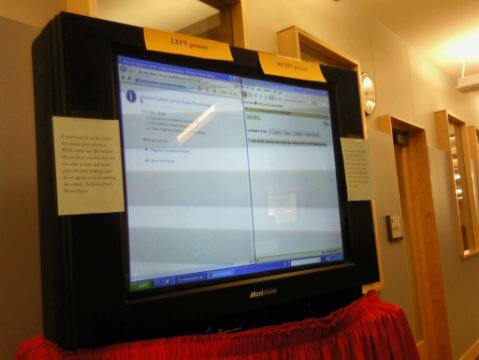 Luckily some of my techie colleagues came up with this solution: a TV connected to a laptop that monitors the print queues. We’ve covered the laptop with a lovely red table skirt, but desk staff can manage the queue when problems arise. Students now have a clear sense of where in the world their paper due in five minutes is. We like this solution because it gives students a clear sense of just how much work our printers are doing in addition to giving them the specific info they need about their print job. Plus the desk staff can provide more immediate assistance with printer problems because they have information at their fingertips, too. My friend Anne’s library on the Trinity campus in San Antonio communicates faculty research with students in an interesting manner. The library’s cafe features a wall dedicated to faculty and their research. 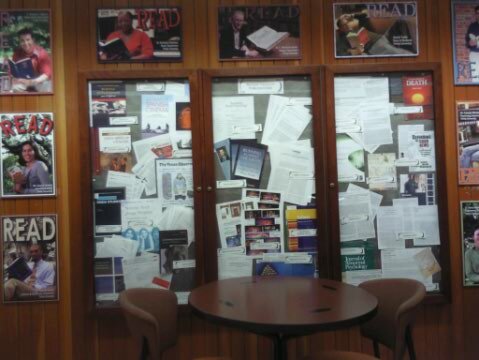 READ posters, starring faculty, surround a large display case that highlights faculty publications. The READ posters grab your attention, inviting you to explore the wall’s contents. It’s a far more interesting and engaging way to draw students in than the usual bulletin board outside of department offices. Plus, I love the way it presents faculty as a college-wide community of researchers. The display case itself is changed out often and attractively organized. This type of work could be done by student workers, giving them the chance to learn how to present research. Plus, they’ll point out their handiwork to friends. We all win. Our library includes the media and computing departments, which means technology is front and center in how we communicate. 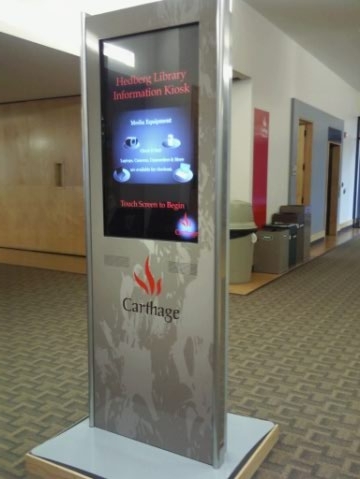 Our media department recently installed a kiosk in the area between the library and our cafe. The shell was built by a company, but the rest is all the result of staff and student work. A monitor and computer are contained in the metal shell (we got to design the outside) which means we can continually edit content. After testing numerous programs, we settled upon software designed for interactive use much like you see at museums. Patrons can access interactive maps, event schedules, faculty and student research projects, the campus directory and other pertinent information. Student workers create slides advertising events, services and resources that run as a screen saver when patrons aren’t accessing information. Recently I ran a scavenger hunt as part of my community Family Fun Night. The first clue advised them where they could access a campus map for use during the night (they were hidden in our cafe.) Community members surprised me by saying they thought I was referring to the maps on the kiosk and used them instead of the hidden paper ones! I’d love to hear your means of communication and how they are working for you. Please share!